I discovered Shojin when I was researching vegan restaurants in Los Angeles. It stuck out to me for two reasons -- (1) really high ratings and great reviews on Yelp and (2) its uniqueness in being an all-vegan, macrobiotic Japanese restaurant offering both maki rolls and nigiri. So, when I had an opportunity to go to southern California, I flew into LAX so I could dine at Shojin before heading out to Palm Springs. From the website, I got the impression that it was a fine, upscale restaurant. When I was searching for it, however, it was not easy to find. I finally called them and they told me they were located in a mall. So, I headed back that way and found them in this weird Asian mall. Hmmm...okay. Nestled among the oddest mix of stores ever from massage chairs and pharmacies to jewelry and junk stores, I found Shojin on the top level. From the outside, it didn't seem like the same place I had read about. The Shojin sign was pretty generic looking and below it there was some sort of poster with red and pink hearts. To the right was a darkly tinted window, which had a red curtain on the opposite side. I was a bit frightened. I peaked through the curtain and found a hostess ready to seat me. We walked through one room and into another and were immediately transported into a nice, dimly lit, romantic restaurant. It was so unexpected. I sat down and took a look at the menu. Shojin is only open for dinner and even though I really wanted to try an entree, I was more intrigued by their rolls and nijiri. 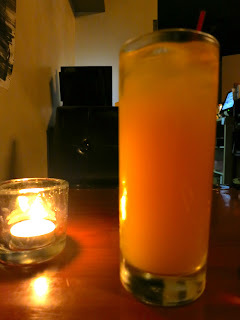 I started by ordering the Peach Detox, which was made with sake and some sort of peach drink. It was light and spicy. I placed my order, then took some time to take it all in. The restaurant was really nice [inside]. The dark wood tables and black chairs along with the flowery Asian prints in a dark, romantic setting all made for a nice ambiance. I started with the Stuffed Shiitake Mushrooms, which were shiitake mushrooms stuffed with tofu, miso, and shiso served with sweet soy sauce. Each mushroom just melted in my mouth. There was so much flavor that I felt I could have eaten an entire plate of these as my entree. Yum! For my entree, I went with the Pirates of the Crunchy. Funny name. These were avocado maki rolls with fried tempeh and green onion prepared in a tempura batter served with spicy dynamite sauce. The rolls just seemed too plain to be paired with this crunchy topping. I liked the topping, but the meal felt like two items put together that didn't mesh. And it wasn't spicy enough. Given the great reviews I had read, I wanted to try one other roll before forming my opinion so I ordered the Rocky Mountain rolls. These were really good. The base was, again, avocado maki rolls with sliced barbeque seitan laid on top and shiitake mushrooms on top of that. It was dressed in a sweet soy sauce and served with wasabi mayo. I think the wasabi mayo really made this dish. I felt like I was in vegan heaven after one bite. As you bite into one of them, you first get the avocado taste, then the spicy mayo followed by a warm firm mushroom and finally the sweet soy sauce. It was so good. After all of that, I was, unfortunately, too stuffed to try any of the desserts. They promptly brought my check and offered to validate my parking, which was a nice touch. All in all, I enjoyed my meal at Shojin, but I didn't think it was really worth going out of the way to eat here. It is good food and it is all vegan, but the rolls are pretty comparable to the rolls I can get at Sticky Rice here in DC. Shojin, however, offers a wider selection of vegan maki rolls, nijiri and Asian entrees than any other Japanese restaurant I've ever been to. The service was attentive, but the prices were slightly high at $13 per roll, although they were pretty large rolls. I would definitely come back and would recommend it to anyone who does not have access to this quality of vegan maki rolls in their city.